Andy Russell, the co-founder of Launchpad Toys -- maker of the awesome Toontastic storytelling app -- once worked for a major toy company. You could design the most wonderful educational toy, he told me, with creative and innovative features, but the marketing department was always interested in the shelf appeal -- as in, what features could be triggered and played with while the toy was still in a box on the shelf at the store. Those features -- press here to trigger a sound, for example -- often trumped any other sort of more open-ended or exploratory element that a toy designer might want to add. After all, there are a lot of toys on the shelf at the store. Companies and marketing departments want their toys to stand out; they want their toys to be purchased. And of course, when you the consumer are shelling out $20 for a toy off the shelf, you expect it to be of high quality. You want it to be fun, to be educational. So what changes -- in terms of the types of toys designed, in terms of the way they're marketed, in terms of pricing -- now that children are spending more time playing with apps and other digital toys? In a lot of ways, Russell argues, we are better off now. Educational toy makers (or rather educational app developers) no longer need to worry about the high costs of distribution to brick-and-mortar stores. They no longer need design their toys around the demands for "shelf appeal." In the app store, the only distinguishing features between different apps are their little logos, their descriptions, the reviews, and of course, the price. Combine the freedom from marketing-oriented design restrictions with the great power of new digital tools like the iPad, and we've seen an explosion in incredible educational software -- typically at a price far cheaper than the $20 or so you'd pay for an educational toy at the store. Of course, those app prices do still vary. You'll find some in the $20 range (and even higher when you look at certain special education apps); you'll find some in the $10 range. There are some for a couple of bucks, and there are some that are free (and are often ad-supported). But it seems as though there's a race to the $.99 price tag. And while that's a great bargain for parents, it may not be sustainable for businesses, particularly for startups that invest heavily in research and development. Yes, there are success stories for app developers who price their software that low, but those are often games or more general interest apps. Remember, the market for educational apps is still quite small. So how then can we ensure that the makers of quality educational content survive? And just as importantly, how do we make sure the price for quality apps remains affordable so that parents feel as though it's worth test-driving an app, particularly an app by a relatively new or unknown company (one without a well-known brand or TV character on its icon)? These questions have prompted Russell, along with GeekDad contributor, author and researcher Daniel Donahoo, to pen the Children's App Manifesto, a call-to-action -- or at least a call-to-conversation about the best road forward in helping sustain high quality educational app content. As Donahoo writes in The Huffington Post, "Everyone with a stake in the future of children's media needs to commit to do their part. Parents need to support exceptional content by looking beyond $.99 apps, publishers need to keep their prices accessible, developers need to avoid the temptation of selling game-play consumables, and investors need to maintain reasonable expectations for returns. In short, we all need to strike a balance between our respective interests and what's best for the long-term viability of the market and for our children to play, learn, create, and grow (hint: it's one and the same)." 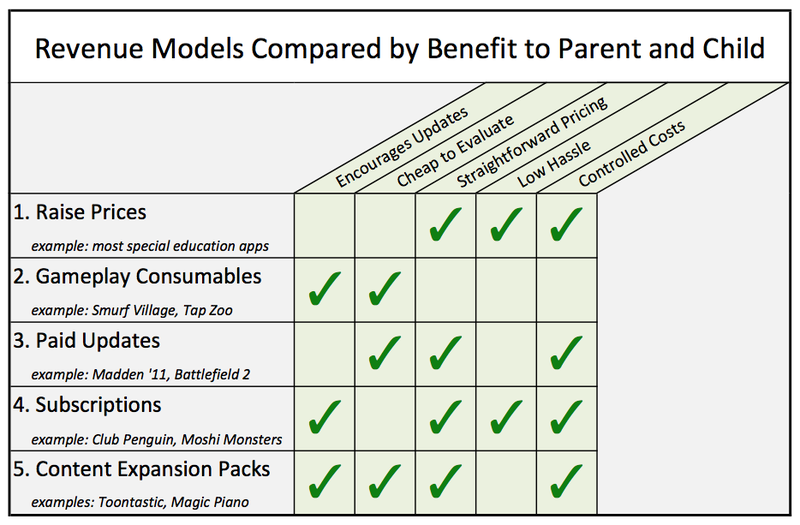 Donahoo and Russell have looked at some of the various revenue models that children's app developers utilize, assessing which ones provide the most benefit to both parents and kids. This shouldn't be about simply raising the price for apps, they contend. But at the same time, it's particularly important that the way forward doesn't exploit kids -- a charge often leveraged at apps that require in-app purchases, such as the infamous Smurf Village app, whereby a special Smurfberry item cost $99, much to the shock of parents who received the bill when their kids made these purchases. Donahoo and Russell contend that subscriptions and content expansion packs seem to provide the best model for everyone involved. The latter is the tact that Launchpad Toys follows, offering the initial Toontastic app for free (currently) but charging extra -- $.99 or so -- for expansion packs. The free app is fully functioning, and the expansion packs offer more characters and themes. This way, costs are controlled; it's cheap for parents and children to evaluate an app. This pricing model also encourages regular updates and fresh new content to keep kids engaged. The Children's App Manifesto asks parents, educators, marketers, investors, app developers to think critically about how we can best support quality educational digital content. With all the possibilities that new digital tools afford kids -- to explore, to play, to learn, to build -- we don't want to put in place a new sort of "shelf appeal" system that diminishes apps' creativity or the sustainability of smart, new app studios.